“This is the next great American Game” It’s a phrase you hear a lot through this documentary which is coincidentally the name of the film. The Next Great American Game follows the journey of Randall Hoyt, a designer and artist who thinks he has in his possession the next board game to take America by storm. Randall is also bipolar and the documentary not only follows Randall’s journey into the world of hobby gaming, it also follows his ups and downs as he deals with his condition. 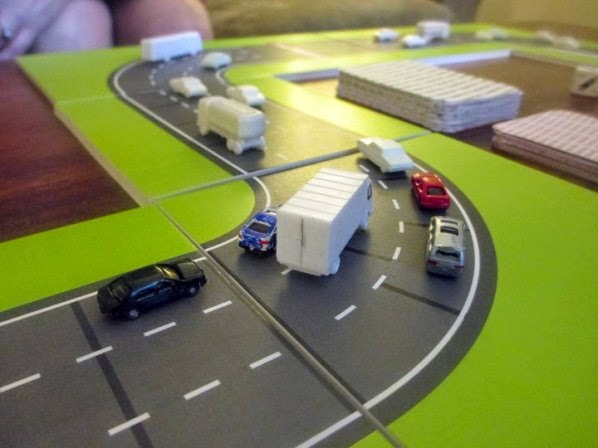 Randall has an idea for a game, correction; he has a fully developed prototype for a game called ‘Turnpike’, a game about manoeuvring through a traffic jam. The film opens with Randall visiting Gen Con as he tries to sell his game into the hobby board game market. Straight away Randall is thrown into a world that is alien to him but one that readers of this blog will be familiar with. We get to see big names in the industry, like Steve Jackson, Jason Mathe and Dan Yarrington, but Randall has no idea who these people are, in fact you get the impression that before this film was made, Randall had never played a single board game outside of scrabble and monopoly. It means we get to see the industry from an outsider’s point of view and we also get to see Gen Con, Origins and the Chicago Toy and Game Fair up close and personal (something I will probably never be able to do myself). At this stage of the film Randall is very naive, his game doesn’t look very interesting and he doesn’t have the faintest clue about the board game market. However, his demeanour can be best described as ‘chipper’ and although you start out thinking he could be a bit of an idiot you soon start to feel for Randall as publisher after publisher tears apart his game in the politest possible way. It’s about this point that we’re also introduced to Randall’s bipolar disorder and the routine he maintains to reduce its effects on his life. The shifts to the bipolar sections are often jarring, which I assume is a conscious decision by the film makers to highlight the extremes of the condition. These sections are at odds with the rest of the film and do make you think that Randall may not be as well as his demeanour suggests. My issue with these sections was that they didn’t go deep enough into what bipolar is and what it does to an individual. The whole concept of bipolar disorder was only vaguely introduced and didn’t really explain the disorder or how it works. If the film makers aim was to document bipolar it failed and if you really want to know more I suggest seeking out the amazing documentary by Stephen Fry. The real story of the film though is the design process. Randall takes on as much advice as he can, tinkering and tweaking his game whenever he receives feedback. Some of that advice is contradictory but Randall takes it all in his stride and learns the real lessons of product design. 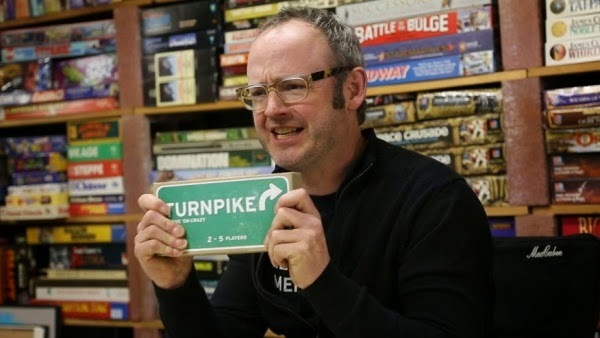 I’m not going to spoil the outcome but, although Turnpike keeps on looking like a terrible game, Randall has something in his back pocket that may just be extraordinary. If you are a gaming fan, and let’s be fair you probably are if you’re reading this, then it’s the extras that are really going to get your dice rolling. 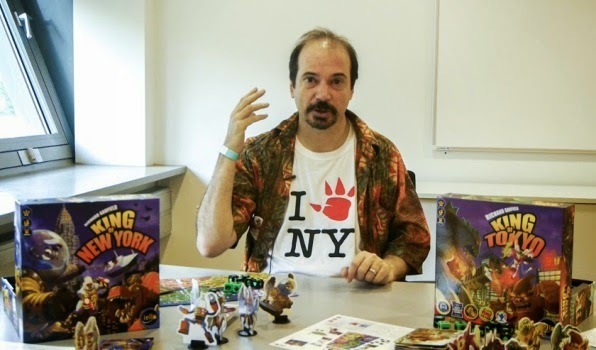 There are a host of interviews with some of the most influential people in the gaming industry, and if you go for some of the more deluxe versions of the film there are hours of insightful conversations with designers like Matt Leacock, Reiner Knizia and Richard Garfield. The Next Great American Game is a film about three different subject matters; the modern board game industry, bipolar disorder and the design process. There’s no doubt it covers one of these aspects better than any other and that is the board game industry. Although the bipolar side of the story is very interesting there wasn’t enough meat it for me, I wanted to know more about the condition and how it affected the people around Randall. However, if you’re a gamer then the interviews and insights from industry veterans are more than worth the price. The Next Great American Game is available from www.tabletopmovie.com. This review is based on a digital copy of the film provided by the publisher.